Mauricio Pochettino, Ronald Koeman, Sadio Mane, Adam Lallana, Dejan Lovren, Nathaniel Clyne, Luke Shaw, Morgan Schneiderlin. The list goes on and on. Yet despite selling more than £185m worth of players, and losing two managers and a chief executive in the past three years, Southampton remain upwardly mobile. The Saints are in the top half of the Premier League, the last eight of the EFL Cup and in line to qualify for the knockout stages of the Europa League. But how have they done it? How has a black box helped them? And how will they keep the momentum going? Before their meeting with Liverpool on Saturday - when they will face up to four of their former players - Southampton executive director Les Reed reveals all. Reed arrived at Southampton in April 2010 and discovered a club low on morale and playing in the third tier of English football for the first time in 50 years. Yet he also found a club that already had an excellent reputation for youth development. Theo Walcott and Gareth Bale had recently been sold to Arsenal and Tottenham for £9.1m and £7m respectively but promising schoolboys remained, including James Ward-Prowse, Luke Shaw and Calum Chambers. Reed told BBC Sport there was "a rich vein of gold" that just needed to be mined. "The focus was to develop the academy in a way that allowed those young lads to become Premier League players," he said. "I said to them, 'we are going to take you on a journey you might not have imagined'." 2015: Players: Nathaniel Clyne (Liverpool), £12.5m, Morgan Schneiderlin (Manchester United) £25m. Southampton invested heavily in human and technical resources. They developed profiles for every youngster in their academy, allowing them to identify gaps in their system and the type of player they needed to recruit to maintain standards. And they rebuilt the scouting network. "When we built our club back up, everybody knew it wasn't about hoping something comes out at the end," added Reed. "Clubs start with a plan but when things go wrong at the top end, it deflects their thinking. We have a clear plan and a clear objective." Saints won promotion to the Championship in May 2011 and returned to the Premier League the following season. By the time of their return to the top flight, with an opening-day fixture at Manchester City, Ward-Prowse and Shaw had already made it through to the first team. Ward-Prowse remains at the club but Manchester United paid £27m for Shaw and Arsenal £16m for Chambers in 2014. Left-back Matt Targett has emerged since then, Sam McQueen, who can play at left-back or on the wing, has broken through this season and another defender, Jack Stephens, scored for England Under-21s last week. Reed had a target of having 50% of the first-team players from the academy - and they have achieved this twice, in matches against Crystal Palace and Sunderland. But the Saints, who were a relatively big fish in the Football League, have needed more than their academy to ensure they have been able to replace players they have sold. The black box might sound like something from a JK Rowling adventure but it is crucial to the club's success. It is a live database, fuelled by six analysts and has records of Saints players at every level, which are audited every six weeks to check whether they are hitting their targets. But it is not just details of current Saints players that are stored in the black box - data is inputted into it from games across every major league. Into it are loaded video clips, performance and statistical data, plus information about the character, personality and injury history of a player. When Reed discusses a potential signing with the manager he has a range of options, all of whom he knows will fit into the style the club wants. "When you are trying to unearth potential that can be turned into excellence, you need lots of information," added Reed. "Scouts can spot a player if they are looking at Gareth Bale - but to find a Pierre-Emile Hojbjerg, you need more detail." Saints signed Hojbjerg, a 21-year-old Danish midfielder, from Bayern Munich in the summer on a five-year deal for a fee believed to be in the region of £13m. The data in the black box helped inform them of the player's suitability for Southampton. They knew that Hojbjerg had been through an excellent academy system at Bayern, that he was bright academically and had bundles of skill and potential. "Performance data allows us to say technically if he is what we are looking for," added Reed. "Physical information is not just high-intensity sprints. It is whether they are in high-level competition, how they hold the ball up, what the first touch is like." A good example of how Saints' long-term thinking and attention to detail allowed them to overcome the loss of an important player revolves around the departure of defensive midfielder Victor Wanyama. They signed the Kenya international from Celtic in 2013 and, according to Reed, he had opportunities to sign a new deal for two years. "It was clear he was being advised not to. When those tell-tale signs started happening we began looking in the black box," said Reed. "Potential replacements for Victor had to meet certain athletic and technical requirements. One of them was Oriol Romeu." Southampton had started monitoring Romeu as a 19-year-old when he joined Chelsea from Barcelona. They kept feeding information into his profile during a loan spell at Valencia. As Wanyama's future became uncertain, Southampton took an additional interest when Romeu joined Stuttgart on loan in 2014. Twelve months later, they approached Chelsea themselves, paying £5m for the player who has this season become Wanyama's replacement. It had been the same with Lallana and Dusan Tadic. Tadic was in the system from 2010 because the club understood that Lallana was developing into the sort of player that other clubs might want to buy. When Liverpool bought Lallana for £25m in 2014, Tadic was one of several replacements the Saints had been monitoring for years. Eight weeks after Southampton won the Johnstone's Paint Trophy in 2010, Jose Mourinho's Inter Milan won the Champions League final to complete the treble. Since 2011, the Italian side have not won a trophy or qualified for the Champions League. At the start of the month, Inter played Saints in the Europa League and lost 2-1. It was a match played just days after they had sacked manager Frank de Boer, who had himself replaced Roberto Mancini after he was dismissed in August. Reed said: "If they go after 80 days, fingers need to be pointed at the people who recruit. "When managers are appointed usually they want lots of changes. They want to bring their own staff, they want money to spend. If you go down that route you are putting everything you have built at risk. "Our manager is a coach. The process is, 'are we the right fit for you, are you the right fit for us?' That is why it goes through several stages." Reed has a dossier of potential coaches that is continually updated - and has been since the appointment of current boss Claude Puel - but he describes it as "very private" and only he has access to it. When the club's Argentine boss Pochettino left for Tottenham in 2014, some thought it would mark the end of Southampton's rise. In fact, they got better, improving their Premier League placing from eighth to seventh and then sixth under Dutchman Koeman. It was the first time they had finished in the top half of the top flight in three successive seasons since 1979-82. Reed did not expect Koeman to leave for Everton this summer - but he had to be ready when it happened. He said: "Succession planning is a major factor in big business. You have to be ready for the surprise. It shouldn't be any different in football yet that is how it appears." One newspaper picked 11 potential replacements for Koeman. Puel was not among them but it was the Frenchman whom Saints eventually appointed on a three-year deal. "Every candidate to replace Ronald was in the system a year before and had a 45- or 50-page document, with a profile. The interview criteria were four pages long. Claude went through three interviews to get the job." 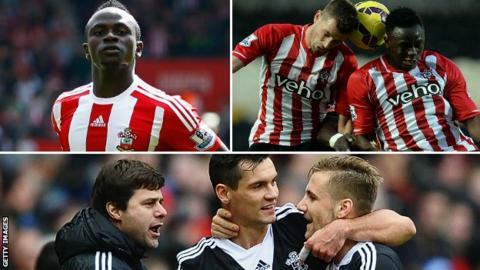 Can other clubs follow Southampton's lead? Southampton have flourished despite losing not just a series of head coaches and key players, but also influential executive chairman Nicola Cortese in January 2014. There could be more change, too. It has been reported Katharina Liebherr, who inherited ownership of the club when father Markus died in 2010, has been in exploratory talks with a Chinese group about selling up. One of the constants at the club over recent years has been the presence of Reed. He has made the director of football concept work under three head coaches. Reed has managed in the Football League, held various key roles at the Football Association including technical director, worked as an adviser, and was director of football at Fulham, unearthing current Manchester United defender Chris Smalling from non-league Maidstone United, before moving to Southampton. "My journey has been fairly unique," he said. "I have had a club life and a national governing body life. I have had an international coaching career, I have had a club coaching career. I have also been a strategic leader in a governing body. All brought together, that makes me ideal for this job." But is it possible to emulate Reed's career? Could the future see more clubs progress like Saints because they have people with the right qualities and experience at the helm of their structure? Reed seems to think so. "There is scope for the Football Association or League Managers' Association to look at how you develop people the way I developed because when you have someone in this role, taking away the things that interfere with the day job, it takes strain off the manager and the chief executive."